An oped on debt in the Washington Post. Growing debt and deficits are a danger. If interest rates rise, debt service will rise, and can provoke a crisis. Really the only solution is greater long-run economic growth and to reform -- reform, not "cut" -- entitlements. And the sooner the better, as the size and pain of the adjustment is much less if we do it now. This is written with Mike Boskin, John Cogan, George Shultz, and John Taylor. George Shultz was the inspiration, and wrote the first draft. He radiates an ethic of government as responsible stewardship, and displeasure when he does not see such. It is a pleasure of my job at Hoover to work with such distinguished colleagues. This month marks the 50th anniversary of Milton Friedman's The Role of Monetary Policy, one of the most influential essays in economics ever. To this day, economics students are well advised to go read this classic article, and carefully. The Journal of Economic Perspectives hosted three excellent articles, by Greg Mankiw and Ricardo Reis, by Olivier Blanchard, and by Bob Hall and Tom Sargent. Friedman might have subtitled it "neutrality and non-neutrality." Monetary policy is neutral in the long run -- inflation becomes disconnected from anything real including output, employment, interest rates, and relative prices. But monetary policy is not neutral in the short run. 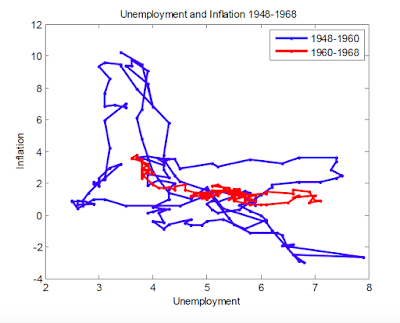 There are three big ingredients of the macroeconomic revolution of the 1960s and 1970s. 1) The remarkable neutrality theorems including the Modigliani Miller theorem (debt vs. equity does not alter the value of the firm), Ricardian equivalence (Barro, debt vs. taxes doesn't change stimulus), and the neutrality of money. 2) The economy operates intertemporally, not each moment in time on its own. 3) Basing macroeconomics in decisions by people, not abstract relationships among aggregates, such as the "consumption function" relating consumption to income. Efficient markets, rational expectations, real business cycles, etc. integrate these ingredients. You can see all three underlying this article. As money is not neutral in the short run, the neutrality theorems are not true of the world in their raw form, but they form the supply and demand framework on which we must add frictions. Friedman's permanent income hypothesis really kicked off the latter, and The Role of Monetary Policy is a central part of the first. 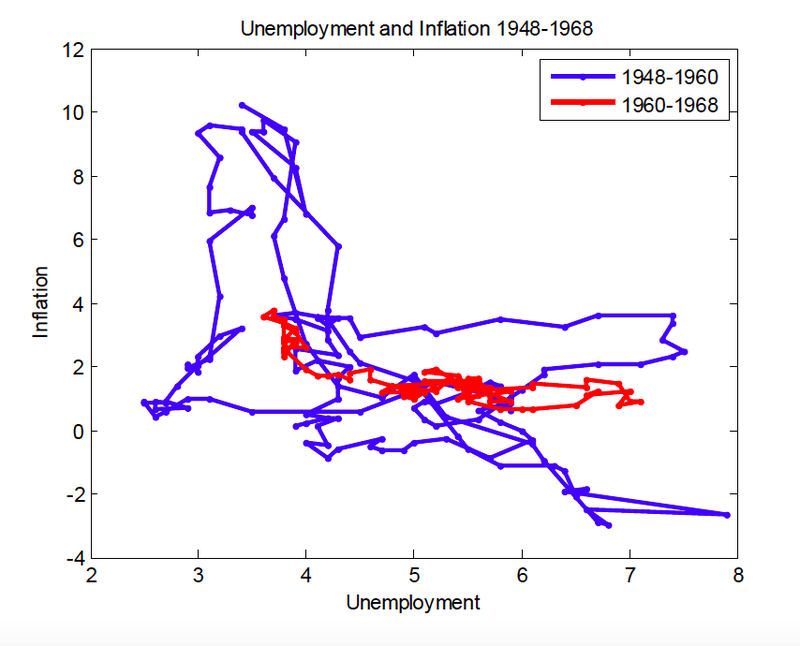 For fun, I plotted the relationship between inflation and unemployment in data up until 1968, with emphasis in red on the then most recent data, 1960-1968. This was the evidence available at the time. The Keynesians of Friedman's day had integrated this idea into their thinking, and advocated that the US exploit the tradeoff to obtain lower unemployment by adopting slightly higher inflation. Friedman said no. And, interestingly for an economist whose reputation is as a dedicated empiricist, his argument was largely theoretical. But it was brilliant, and simple. Unintended consequences of well-intentioned policies, unexpected behavioral changes in response to ignored incentives, unusual supply (or demand) responses to demand (or supply) interventions, and clever new pathways for changes to happen are the sorts of mechanisms that make economics fun, and I hope useful to cause-and-effect understanding of human affairs. A case in point is an Atlantic article from 2012 that a friend pointed me to last week, by Richard Sander and Stuart Taylor Jr.
... UCLA, an elite school that used large racial preferences until the Proposition 209 ban [on overt racial preferences] took effect in 1998... Many predicted that over time blacks and Hispanics would virtually disappear from the UCLA campus. ...The total number of black and Hispanic students receiving bachelor's degrees were the same for the five classes after Prop 209 as for the five classes before. Indeed, I too would have guessed, if I didn't think hard about it, that eliminating racial preferences would have to have reduced the number of minorities who graduated, and that the affirmative action argument would have gone on to other pros and cons. But that's wrong. First, the ban on preferences produced better-matched students at UCLA, students who were more likely to graduate. The black four-year graduation rate at UCLA doubled from the early 1990s to the years after Prop 209. Yes. Half the admits but double the graduation rate leaves constant the number of graduates. Thus, Prop 209 changed the minority experience at UCLA from one of frequent failure to much more consistent success. The school granted as many bachelor degrees to minority students as it did before Prop 209 while admitting many fewer and thus dramatically reducing failure and drop-out rates. And a proponent of affirmative action could nonetheless make many arguments consistent with this work. Perhaps dropping out of UCLA is good for people. Perhaps more minorities on campus is useful for white students' social perceptions, even if it harms its intended beneficiaries. Perhaps things were going on at other universities that drove minority upperclasspeople UCLA's way. UCLA is part of the California state system, which encourages transfers at year two, which is not the case everywhere. I also don't know how the numbers are holding up post 2012. Finally, racial preferences seem to have advantaged whites by keeping asians out, which is an interesting scandal by the silence surrounding it. Today's post is not about this larger argument. I'm willing to bet Brad DeLong still blogs I'm racist for even mentioning the topic, but that will be an interesting test of today's political climate. 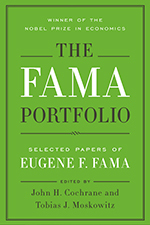 The Fama Portfolio, is a new book from the University of Chicago Press. This is a collection of Gene Fama's papers, edited by Toby Moskowitz and me. It includes introductory essays by a group of Gene's distinguished colleagues, Ken French, Bill Schwert, René Stulz, Cliff Asness, John Liew, Campbell Harvey, Jan Liu, Amit Seru, and Amir Sufi. The essays explain the ideas in modern terms, tell you why the papers are important, explain how the papers influenced subsequent thinking, update you on where our understanding on each point is today, and speculate about where new ideas may go. The continuing vitality of this work, even parts decades old, is impressive. The task was hard. Which Fama papers should one read? Well, all of them! but we nonetheless had to pick. We typically chose a famous one from early in one of Gene's many research programs, and then a less known later one that really sums it up clearly. Gene's ideas get clearer over time, just like the rest of ours do. Other authors may post their essays on their webpages. Otherwise, you'll just have to buy the book! ... Buybacks do not automatically make shareholders wealthier. Suppose Company A has $100 cash and a factory worth $100. It has issued two shares, each worth $100. The company’s shareholders have $200 in wealth. Imagine the company uses its $100 in cash to buy back one share. Now its shareholders have one share worth $100, and $100 in cash. Their wealth remains the same. Wouldn’t it be better if the company invested the extra cash? Wasn’t that the point of the tax cut? Perhaps. But maybe this company doesn’t have any ideas worth investing in. Not every company needs to expand at any given moment. Now suppose Company B has an idea for a profitable new venture that will cost $100 to get going. The most natural move for investors is to invest their $100 in Company B by buying its stock or bonds. With the infusion of cash, Company B can now fund its venture. An oped on tariffs, for Fox news here. That tariffs are bad is rather obvious to readers of this blog, but perhaps marshaling and digesting things we've known for 250 years is worthwhile. In a remarkable achievement, President Trump has united the nation’s economists by proposing tariffs on imported steel and aluminum, tariffs designed to reduce imports of those goods. Tariffs are bad for the economy. Tariffs on raw materials, produced by machine-intensive dirty declining industries are worse. Trade is good. Trade is good. Why? Follow the money. If China sells us, say, a solar panel, what does it do with the dollars? There is only one thing to do with dollars — buy American goods, invest in America, or buy our government debt. Oh, and we also get a nice cheap solar panel. China might use the dollars to buy, say, wheat from Australia, so it looks like China sells us more than we sell them. But then Australia must use the dollars here in America. Dollars always come home to roost. So how much more one country sells us than we sell them — the “bilateral trade deficit” — really is pretty meaningless. The rest of the world sells us more than we sell them. But the rest of the world uses every cent of the extra dollars it gets from that trade to invest in the U.S. and to buy our government bonds. If we sell the whole world exactly as much as they sell us every year — in other words, if there were no overall U.S. trade deficit — we’re the ones who would have to start saving huge much larger amounts of our incomes in order to invest in U.S. companies, give mortgages to people to buy houses, and to fund the governments’ $1 trillion deficits. Once per decade or so it is worth revisiting the famous 1930 economists' letter on Tariffs. (The link, at econjournalwatch.org, has a concise history and links to more.) 1028 economists -- a huge proportion of the number then around -- signed the following, urging President Hoover to veto the Smoot Hawley tariff. We know how it turned out. No, we did not win that trade war. Well, not until about 1945. Perhaps, as with DACA, the President using the existing law, which allows and even encourages widespread protectionism, this action will spur Congress to pass trade laws that require a bit more than vague "injury" to industry or "national security" fantasies. But I am straining to find a silver lining. The darker possibility. Many administrations start with some policy victories -- judicial nominees, deregulation, tax reform -- and then over reach. This may be the start of over reach. Rereading the letter, it is impressive for stressing simple truths that apparently remain mysterious to many even today. If we buy a good from overseas, the dollar must come back, either as a purchase of American goods or investment in American capital. Conversely that purchase or investment cannot happen if we do not allow foreigners to sell us things. Open trade is important to peace and stability, not just prosperity. It stresses the final effects on people who end up paying more and working less, not just downstream producers. The undersigned American economists and teachers of economics strongly urge that any measure which provides for a general upward revision of tariff rates be denied passage by Congress, or if passed, be vetoed by the President. We are convinced that increased protective duties would be a mistake. They would operate, in general, to increase the prices which domestic consumers would have to pay. By raising prices they would encourage concerns with higher costs to undertake production, thus compelling the consumer to subsidize waste and inefficiency in industry. At the same time they would force him to pay higher rates of profit to established firms which enjoyed lower production costs. A higher level of protection, such as is contemplated by both the House and Senate bills, would therefore raise the cost of living and injure the great majority of our citizens.